In the 1990s, games started to move from 2D to 3D and if an alien would have landed on earth back then, it surely would have thought that nobody needs these low-res polygon-models without any filtering. Then it would destroy the earth. By the way: even today some people are crazy about the Mode 7 and use it for some projects with the RPG Maker. Impressive! All the bushes, trees and enemies in Don’t Starve are flat. And i think it looks awesome! For me, Diablo 2 (2D ARPG from year 2000) was the first game which brought the “Moon Patrol”-parallax effect and something like the “Mode 7”-floor-rendering together. It looks like in Don’t Starve, but remember: Diablo 2 is a 2D game! There’s no official information about this mode. All what you read now, was only possible by using the awesome tools/documentation by Tom Amigo and Paul Siramy – special thanks to Paul, which answered all my questions and supported me a lot! It might seem, that Blizzards coders only move the sprites somehow but if you compare the game with perspective mode on and off while standing still, it gets better visible, that they actually “tilt” everything towards the horizon. Let me demonstrate what (i assume) has to be done. On the next picture you can see a standard ISO view. Below that, there are the steps which i had to make to “fit” the sprites to a “perspective” ground. I had to re-position, re-scale and deform twice to fit them to the floor-grid. 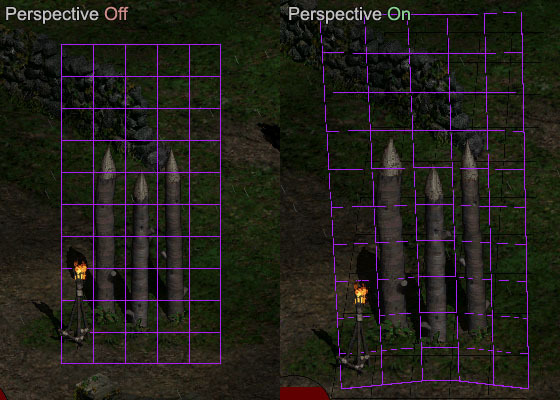 This mode was only activatable with D3D in fullscreen (Diablo 2 also supported Glide and Software Rendering) what made me trying to get my hands on old DirectX-Documentation to get more information. But i wasn’t successful. All this is alien technology! 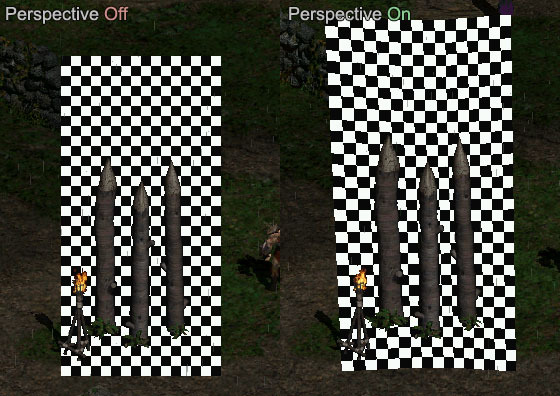 Thanks hans wurst for this link about image aberration which really looks like what we see in Diablo 2 (with activated perspective mode). I don’t know, if this is what the D2-Coders used but at least it looks very similar. Paul Simary just mentioned this article on Gamasutra where more details about the perspective mode where revealed. Thanks Paul! That’s awesome! A solution occurred to him late one morning. 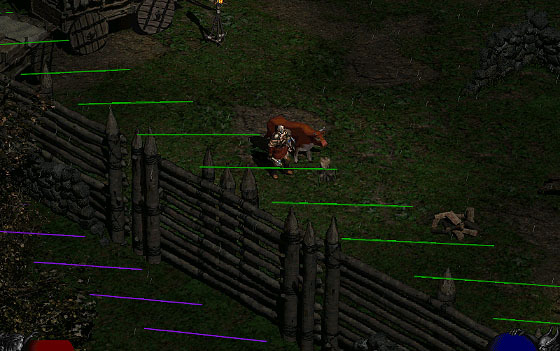 Like the original game, Diablo IIunfolds on a grid, with one major difference. Each diamond-shaped tile is composed of several smaller diamond tiles that allow for some overlap. 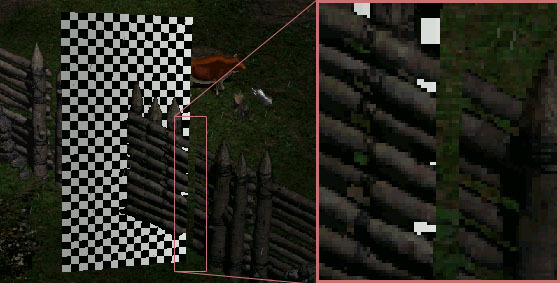 This meant that objects such as player-characters, monsters, treasure chests, and items can occupy the same squares on a grid by standing in smaller squares within each larger square, an impossibility in the first Diablo. 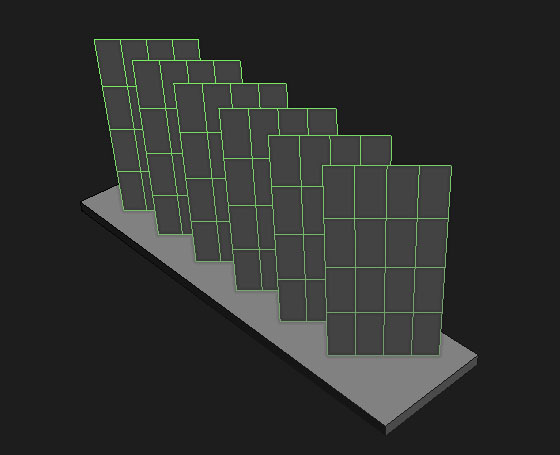 A more granular layout facilitated Dave’s pseudo-3D solution, which he called Perspective Mode. His idea was to take the texture stored in every miniature tile and rotate it just a smidge, so that it wasn’t quite orthogonal, as players moved around the screen. The game passed those textures to the video card, which painted them onto two polygons and then stretched them vertically and horizontally so that they appeared larger or smaller depending on the player-character’s position. Trees and buildings, for example, seemed larger or smaller as players moved closer or further away, and scrolled by at a different speed than other objects in the foreground and background, creating a parallax effect. 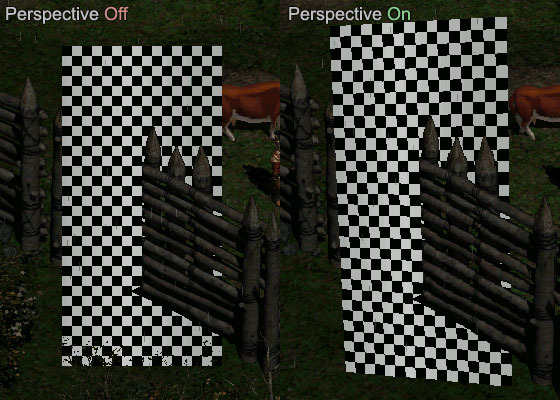 Objects shimmered slightly, the result of bilinear filtering, a process baked into graphics cards that smooths out textures when objects are rendered larger or smaller than their native resolutions. This entry was posted in Game Art Tricks and tagged Diablo 2, Don't Starve, Mode /, Moon Patrol, SNES on 25. February 2014 by Simon. Does it have anything to do with the position of the piece in the middle. Even in the non-perspective version it’s positioned closer to the camera/lower than the other two. So maybe it’s to do with the fact that they don’t all stick out of the ground at the same height as each other. Just a thought. Thanks for your comment :) I’m not sure because this bending has to work on all of the sprites of the same type (oriented to the camera direction). So if you paint something different on the texture, (e.g. three pales sticking at the same “height” in the ground) it has to work too…that would be my thought. Thank you very much :) Good to hear! Maybe the bending is just a camera wide-angel distortion “fake” ? Thanks for sharing. Very interesting and useful. 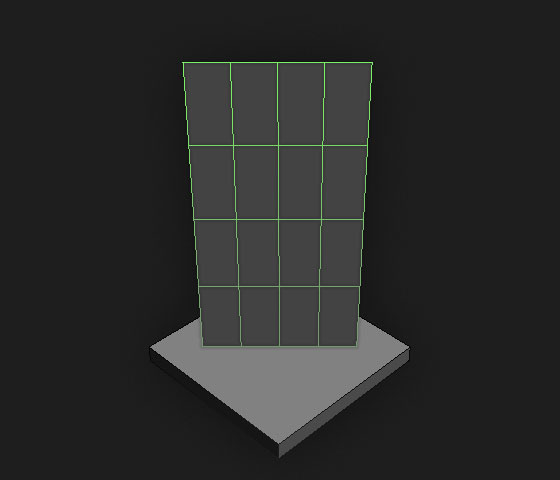 I am using three dimensions and transporting depth information to the player is very hard using orthographic projection. Glad you find it useful :) The wurfel engine looks interesting :) Remembers me on Zomboid! Cool!